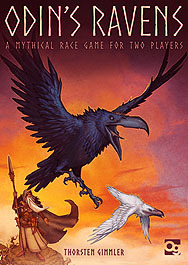 Race through the landscape in opposite directions to be the first to return to Odin. Focus on speed, or enlist the help of the trickster god Loki to create shortcuts and hinder your opponent. Can you be certain Loki's changes won't help your opponent instead? There's only one way to find out. This revised edition of Thorsten Gimmler's award-winning game has been completely redesigned, with new rules and a beautiful new art style inspired by Norse mythology. This is one of those games that takes a couple of plays to really see how it plays. It seems like a simple pick a card up if it matches put it down, that is until you realise the use of the reserve cards you can place, then the game takes on a whole new dimension. You stop thinking just what can I do with these cards now and start to think more about how you can use them in the future. I enjoy playing this game and find it a challenge every time I play to make the best out of the cards that I have.